A daughter needs a father to protect her from thunder and lightening. When I wrote that statement for my first book, Why a Daughter Needs a Dad, I quite literally meant it. 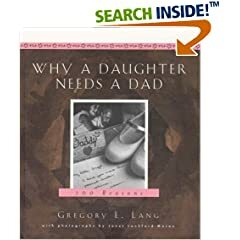 My daughter was only eight years old at the time and still came to my side or crawled into my bed whenever a severe storm loomed over our home. It was my job back then to provide comfort and give reassurance that I would always take care of her. Over the years my daughter’s fear of thunder and lightening has faded, but not her need for my comfort and reassurance. She still comes to me when tears fill her eyes or when doubt enters her mind. I still embrace my role as her protector. But while many of her fears have faded during the last ten years, my worst — the fear some harm may come to my child — has not. I once was afraid she might burn herself while learning to cook and later, have an accident while behind the wheel of her own car. Now I fear what unknown harm may come to her after she leaves home to attend college. You see, she will be miles away then, unable to call out for me or rush to my side. I will not be near enough to see that look on her face that tells me she needs me even though she has not yet said a word. In the last few weeks we have together before she leaves, I do the only thing I can think of to calm my fears – talk with her every day, inquiring if she remembers how to handle this or that situation, what to do if, and more. She always has the right answers, than God, and she doesn’t protest my relentless hypothetical scenarios. She understands, and appreciates, that I’m only doing what a dad does. Protect his own. Protect her.